Over the past year, there have been numerous reports of cribs being recalled, especially ones referred to as drop-side cribs. For many parents this is difficult to comprehend, since a baby’s crib is supposed to be the safest place in the home. It’s considered an area that no harm can occur; a soft, warm and secure place. In fact, it’s the one place where most parents of a child, whether a newborn or toddler, feel they can leave their babies for hours at a time without worry of harm being done. Unfortunately, this is not always the case. Cribs from well-known companies have even been involved in recent recalls. In July of 2010, Pottery Barn Kids and the Consumer Product Safety Commission issued a voluntary recall because of a risk of falls as well as entrapment and possibly suffocation existed with these types of cribs. Unfortunately this is nothing new as far as this type of crib. The problem stems with babies getting trapped and suffocating. The Pottery Barn Kids drop-side crib recall is many in a long line of dangerous crib recalls. In November of 2009, The CPSC with the cooperation of Stork Craft Manufacturing Inc. of British Columbia issued a voluntary recall of as many as 2 million cribs and again, drop-side styles were at the center of the recall. The units were distributed in the United States and Canada. In this case, the problem had to do with the cribs’ drop-side plastic hardware. Apparently it can break, or go missing or is basically defective to begin with. What’s more, this type of crib can mistakenly be installed upside-down, which can mean broken or improperly put together plastic parts. All these potential mishaps or problems can lead to the perfect storm when it comes to the safety of a child as a parent lays him or her down for a long slumber or a short nap. Basically, when the drop-side of a crib comes apart, it means a space or gap is created. When this occurs, the small bodies of children get caught or trapped in the space. Since infants simply don’t have the strength to pull themselves to safety, they wind up either suffocating or in some cases falling from the crib and suffering severe head or other body injuries that may lead to death. The problem with crib injuries and deaths goes back decades. In fact, deaths involving kids and cribs where the child has suffocated goes back 70 years. Entrapments have been happening for decades as well. Since the mid 1970s, 34 kids have died while in their crib, all because of compromised structure and although, government agencies have done a decent job of educating the public about the dangers of weak or faulty cribs, children are still injured or worse. It is important to note, especially in tough economic times, that since the early 1980s, it has been against the law to sell even a second-hand crib that does not comply with specific government safety standards. So parents must use proper judgment when purchasing a used crib. Despite numerous news reports about the dangers of certain types of cribs, the problem still persists. We’ve seen numerous recalls of drop-side cribs and more often than not they generally come after a child or children have been injured. Case in point: A one-year-old baby passed away after being suffocated in his crib in the New England area. The infant became trapped between the frame and mattress of the crib. This case dealt with the Simplicity full-size crib and a recall was issued by the Consumer Product Safety Commission. In its report, the CPSC said the defect could be deadly if the frame of the crib comes apart or twist or bends. This could cause an area of the mattress to cave in, which may cause a baby to get caught, become stuck or possibly fall through. When a safety expert speaks about a child becoming trapped in a crib, it is generally the result of poor design. In too many cases, this has led to a laundry list of problems; everything from traumatic brain injuries to a baby accidently suffocating or being strangled. The Consumer Product Safety Commission is an excellent resource for learning about recalls and the safety of products. The agency reminds parents not to use any crib with missing, broken, or loose parts. 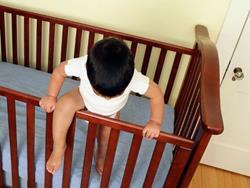 Moms and dads are urged to tighten hardware and in general make sure the crib is sturdy. Another important reminder is to make sure any drop-side or other moving part operates smoothly. Basically parents should make sure that all parts are working properly since any flaw or loose part could cause a potentially catastrophic problem. Child crib death attorney Jeffrey Killino is not only an experienced lawyer, but a child advocate. When a child injury occurs, whether it is a because of faulty crib or other product, he has the know-how and resources to guide you through the legal process to get what you and your family are entitled to. If your child has suffered a traumatic injury because of a company’s negligence, Jeffrey Killino can help. Contact child crib death attorney Jeffrey Killino today at 877-875-2927.